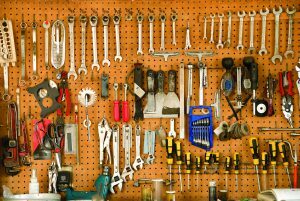 Despite other intentions, homeowners often turn their garages into storage centers for random, little-used items, leaving little to no room for the tools and even vehicles that actually belong in a garage. Such homeowners may turn to sheds to store their garage overflow and keep yard equipment at the ready, but storage sheds are not immune to clutter, and homeowners may find the very structure erected to keep them organized requires a bit of organization itself. A well-organized shed can save homeowners time and energy, as it’s easy to abandon or delay a project if you can’t find that pair of work gloves you stashed. The first step to any organizing project is to take everything out of the shed and determine just what needs to go back in. Items that do not belong in the shed should be moved to their rightful locations or tossed in the trash if they’re no longer needed. Make a pile of anything that will be kept, a separate one for donations and a third for garbage. Take inventory of what you have so you know whether you’re missing any items or you have something and do not need to purchase another. Now that the entire shed is empty, you can assess just how much room you have. Utilizing vertical and overhead space effectively can free up areas on the floor for larger equipment. Shelving, racks, pegboards and any other materials that enable you to hang or store items off the floor are good investments. 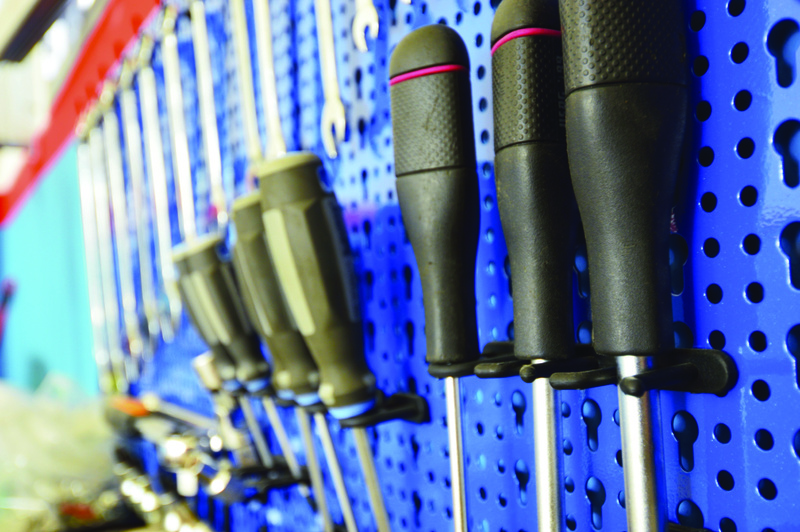 Visit your nearby home improvement retailer to find items that can simplify your storage. You also may be able to put scrap wood to use to make your own storage shelves or a work bench. Extra kitchen cabinets can be installed in the shed to organize additional items. In order to remember where items go, label or sort them accordingly. Some people like to take organization a step further by tracing the outline of tools hung on the wall so they can be placed back in the same spot after use. 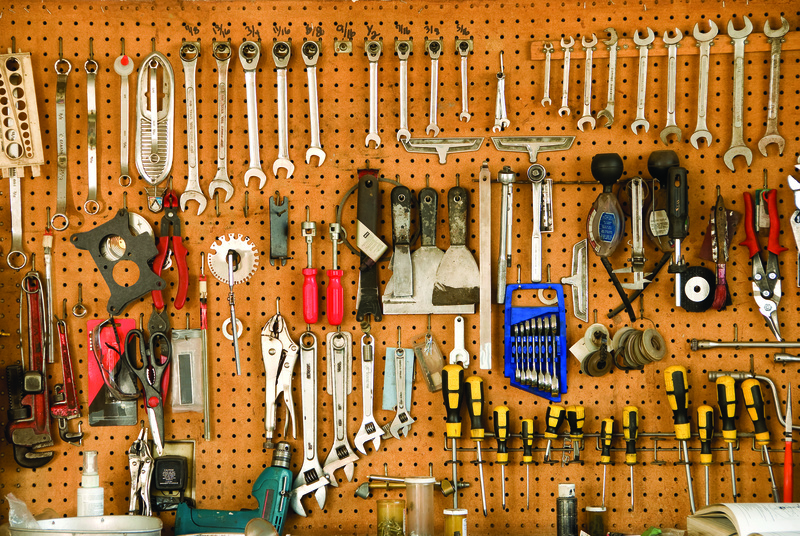 This also serves as a visual reminder of which tools are missing and which ones need to be purchased. Don’t forget to utilize shed doors as additional storage space. Hang frequently used tools, such as rakes and shovels, on the inside of the doors so they will always be easily accessible. You also can repurpose storage solutions designed for other areas of the home. For example, magnetic knife holders can be mounted to a shed wall to keep paintbrushes organized. These holders also can be used to keep many small metal tools tidy. Metal funnels can hold twine and string. Thread through the narrow end of the funnel for a handy dispenser. Keep dangerous substances off the floor and out of reach. Gasoline, chemical fertilizers and other potentially dangerous substances should be stored high up to keep pets and children safe. Make sure the shed floor is sturdy and level. This makes it easier to neatly store larger items. Roll in the lawnmower, wheelbarrow and any other cumbersome items. Now that more things are mounted vertically, you should find that you have more area to move around. Taking the time to clean and organize a shed can help make anyone more productive.